ComputerPranks.com: Tons of jokes, funny software & images, humor postcards, media humor, pranks, gags, & other silly stuff! 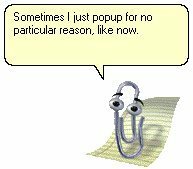 How annoying is that Microsoft Office Assistant. This prank lets you create your own crazy messages for Clippy to say. Complete with sound and custom messages, this prank is a must download! Clippy looks identical to the real clippy, only better!